The AT 105 Saxon is a wheeled armoured personnel carrier (APC) operated by infantry battalions and elements of supporting arms of the British Army from the mid-1980s right into the new millennium. Procured as wheeled armoured transport that would allow infantry assets to travel at considerable speed under armour protection, the AT 105 Saxon also saw service as an internal security vehicle in Northern Ireland, as a patrol vehicle during peace and stabilisation operations in Bosnia and Herzegovina, and as a counterinsurgency vehicle in Iraq and Afghanistan. This publication describes the complicated development history, the technology and all variants of the Saxon in great detail. An additional chapter covers the export versions. Tankograd Publishing has a phenomenal release rate of armour related titles onto the market, releasing six or more titles every three months for the armour modeller to lap up. 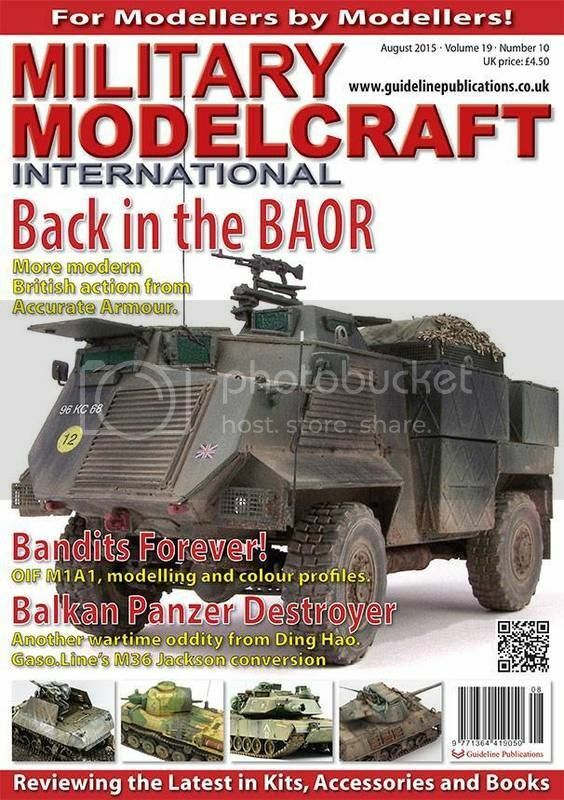 One of the latest titles from Tankograd Publishing looks at the AT 105 Saxon. This offering from Tankograd Publishing is a soft back book with a glossy card cover, inside there are 64 pages of high quality glossy paper. This is a duel language publication in German and English, German on the left and English on the right. All of these sections are covered in 13 pages, and so while the text is minimised, it does do a fair job of providing enough information for the modeller with an interest into the history of a vehicle. The photographs in this title from Tankograd Publishing, are for the most part colour, but where needed due to available images some are black and white. I actually like to see a mix of colour and black & white photographs, colour because it provides good reference on the look of the finished vehicle, black & white as it shows the details present more clearly. The photographic quality is quite good throughout and within the limits of acceptance for the quality of the period. The book does a good job of covering the vehicle exterior from many angles, this also includes many different set ups of the AT 105. all of the images have very thorough captions with them, these clearly explain what you are viewing and are also supplied in both German and English. I am not aware of any AT 105 models being available at this time, but I suspect something in resin may be out there somewhere; as such this will make for a useful reference. The images are of a very acceptable standard and well presented in a logical order; the addition of clear captions further enhances their usefulness. For those interested in the vehicles history, and to some extent future history, this release from Tankograd Publishing will provide the basics and a good understanding in most respects. The numbers of AT 105’s that are being sold around the globe, should make for some interesting colour schemes when a main line producer releases a model. Highs: Good images for the time period and well captioned text to explain what is being displayed. Lows: No obvious issues with this title. Verdict: While the AT 105 Ambulance is all that is left in British Army use, the AT 105 fleet has had good sales to future users. Thank you for the added info. Both of the AA kits are all resin now (with a PE fret), the white metal bits are in the older original kits but Derek can sort you out with resin replacement parts. IIRC the only difference between the two is the cupola on the Mk-I and the peak turret on the Mk-II, aside from that the kits should be identical. I built the Mk-I for the August issue of MMI, it's a fairly straight forward kit without a ton of parts.